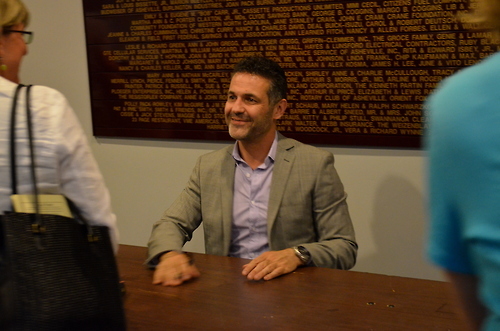 Khaled Hosseini, author of The Kite Runner and A Thousand Splendid Suns, discusses his new book And the Mountains Echoed with author Patti Digh. #1 New York Times bestselling author Khaled Hosseini has written a new novel about how we love, how we take care of one another, and how the choices we make resonate through generations. Following its characters and the ramifications of their lives and choices and loves around the globe—from Kabul to Paris to San Francisco to the Greek island of Tinos—the story expands gradually outward, becoming more emotionally complex and powerful with each turning page. Khaled Hosseini was born in Kabul, Afghanistan, in 1965. His father was a diplomat in the Afghan Foreign Ministry and his mother taught Farsi and history at a high school in Kabul. In 1976, the Foreign Ministry relocated the Hosseini family to Paris. They were ready to return to Kabul in 1980, but by then their homeland had witnessed a bloody communist coup and the invasion of the Soviet Army. The Hosseinis sought and were granted political asylum in the United States, and in September 1980 moved to San Jose, California. Hosseini graduated from high school in 1984 and enrolled at Santa Clara University, where he earned a bachelor's degree in biology in 1988. The following year he entered the University of California, San Diego, School of Medicine, where he earned a medical degree in 1993. He completed his residency at Cedars-Sinai medical center in Los Angeles and was a practicing internist between 1996 and 2004. In March 2001, while practicing medicine, Hosseini began writing his first novel, The Kite Runner. Published by Riverhead Books in 2003, that debut went on to become an international bestseller and beloved classic, sold in at least seventy countries and spending more than a hundred weeks on the New York Times bestseller list. In May 2007, his second novel, A Thousand Splendid Suns, debuted at #1 on the New York Times bestseller list, remaining in that spot for fifteen weeks and nearly an entire year on the bestseller list. Together, the two books have sold more than 10 million copies in the United States and more than 38 million copies worldwide. Hosseini's much-awaited third novel, And the Mountains Echoed, will be published on May 21, 2013. In 2006, Hosseini was named a Goodwill Envoy to UNHCR, the United Nations Refugee Agency. Inspired by a trip he made to Afghanistan with the UNHCR, he later established The Khaled Hosseini Foundation a 501(c)(3) nonprofit, which provides humanitarian assistance to the people of Afghanistan. He lives in Northern California.